De Leon Dynamics is the hottest fitness facility in San Diego’s north county coastal area. Located south of 78 off Sycamore in the Vista Business Park. Serving Carlsbad, Vista, San Marcos, Rancho Santa Fe, San Elijo, Bressi Ranch, and beyond. Parties and events will be available on Fridays, Saturdays, and Sundays. Preschool Classes are 50 minutes long. Kids and Adult Classes are 1-hour long. For information about our annual registration fee, makeup policies, drop policies, etc, please visit our class information page. Our facility is perfect for training all aerial apparatuses! Seventeen (17) aerial rigging points on pulley systems with 24′ ceiling height. – Hanging Chinese poles and more! 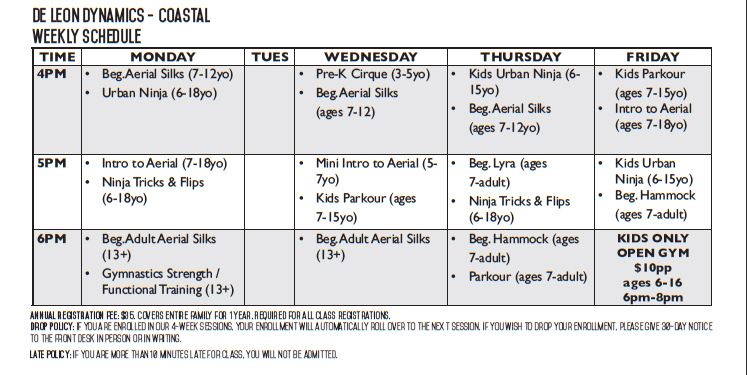 A dedicated area for training for America Ninja Warrior or developing gymnastics strength! De Leon Dynamics – Coastal has a gymnastics spring floor covered with 2″ thick foam flooring.